From a safety perspective, and to prolong its economic life, the regular maintenance of all sports hall, trampolining, gymnasium, P.E. and gymnastics equipment is essential. British Standard 1892 Part 1:1986 states that “It is important that all physical education apparatus is maintained in a first class, fully safe condition. General maintenance should take place regularly. An inspection should be carried out at least once a year.” We recommend that all relevant equipment is serviced at least annually by properly trained and experienced Continental engineers. All sports hall, trampolining, gymnasium, P.E. and gymnastics equipment must only be used by suitably trained and qualified personnel and all such equipment must be visually inspected by the suitably trained personnel prior to each use. That regular inspection must be backed up by a regular inspection from a third party such as Continental’s maintenance team. We have a dedicated maintenance department to undertake safety inspections and preventative and reactive maintenance on indoor sports equipment, gymnastics equipment and physical education equipment. We also offer an inspection service on outdoor physical education and sports equipment. If you would like to arrange a maintenance visit please contact us today. 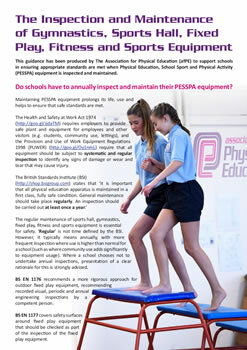 The Association for Physical Education (AfPE) has issued guidance for schools on The Inspection and Maintenance of Gymnastics, Sports Hall, Fixed Play, Fitness and Sports Equipment. Their guidance highlights key requriements that schools and local authorities should consider when selecting a sutiable company to carry out their sports equipment maintenance. We are pleased to provide a link to that guidance - click on the image to the right. Prior to placing your order please refer to our Terms and Conditions of Equipment Maintenance. All orders for maintenance work to be undertaken are accepted on these terms and you should ensure you have read, understood and accepted these terms. If you are unable to fully understand or read our terms and conditions please call us on 01484 542 051 - we would be happy to email, fax or post a larger type version to you. Should you wish to replace parts and undertake simple maintenance work on your PE and sports equipment, we stock a huge range of spare parts to suit our equipment and equipment made by many other companies. We find that some maintenance companies try to "lock-in" their customers to purchasing over-priced spare parts, but we are pleased to offer a wide range of spares at sensible prices that are suitable for self-install to save you money. 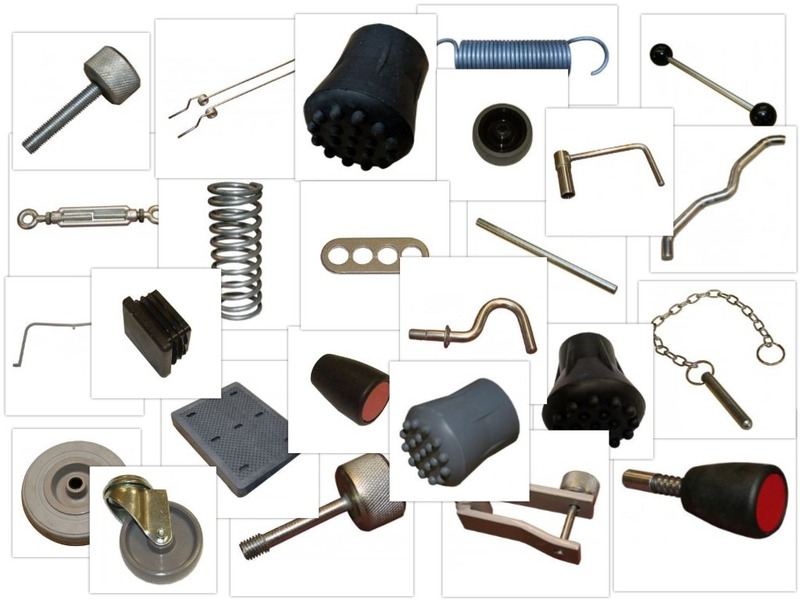 Please click on the image below to see our full range of spare parts.